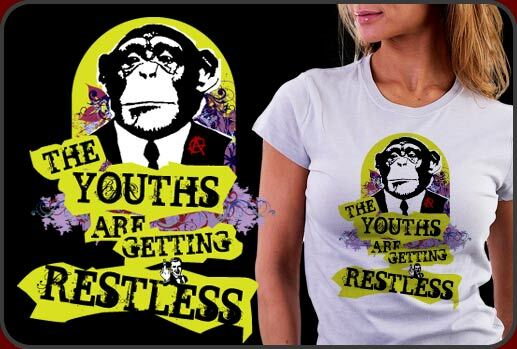 Wildly rebellious The Youths Are Getting Restless art tshirt is making waves big time! We only just introduced our new art tshirt entitled, The Youths Are Getting Restless and already we are getting orders and complements on them. It's rewarding to see so many different sorts of people enjoy our art tshirt line and so we are looking forward to extending the line of art tshirts on our site in the near future. This art tshirt really stretches the limit on colors that punch and imagery. It speaks of the restlessness of our youth and how their time is coming soon. Very gritty but humorous art tshirt that looks terrific on any color. This design looks great on both men and women's shirts so click the image to the left and choose a style and color you like best!